Hmm…good company, good drinks or good food. What makes a great event, especially a dinner party? I go with Virginia Woolf, to dine well makes everything else better. We’re all foodies now thanks to Bravo’s “Top Chef,” the Food Channel and Martha Stewart. So feed me something fabulous—something with a twist that I can talk and tweet about long after I leave the party. Our Pear Twist team found what we’re serving at our next dinner party thanks to Sprinkle Bakes. 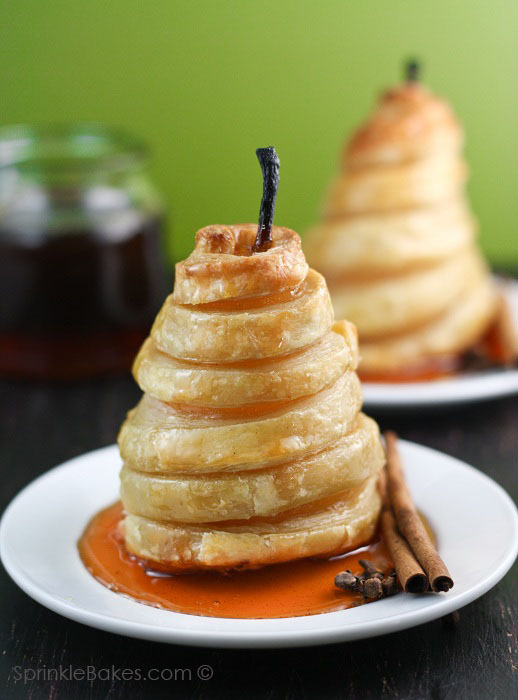 Honeyed pears in puff pastry, love it! Naturally, our theme colors will be green and brown. Would you attend?